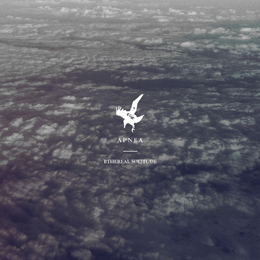 One of the best acts I know from New Zealand are Apnea, which were formed about four years ago by Drew Reid. Initially Apnea was supposed to be a solo-outfit by this multi-instrumentalist, but after a (short) while he joined forces with guitar player Ben Mikkelsen, and together they created a first EP in 2012, called Silent Cities. It was released via Belgium’s Immortal Frost Productions, just like this album, and the review, done by undersigned, was updated on this site on September 30th 2014. After a period of relative silence (Drew moved over to Australia), he and Ben started writing new material. However, Drew wanted to focus on guitars and bass especially, and that’s why they recruited Sean O’Kane Connolly (of In Dread Response / Taur Nu Fuin / Goath Anair-fame) to do the vocals. That’s a first inherent difference in between the sound on the EP and the new full length, yet the song writing too has evolved (read: grown) a little. Ethereal Solitude (35:12) opens with Trees, which starts extremely integer, mesmerising, sober. Slowly this Post-approach grows, with choir-like vocals and cold bass lines approaching, step by step. At last, after four minutes, the sombre Shoegaze dream-passages make room for melodious, atmospheric, and, why not, somewhat DSBM-oriented Black Metal, which wouldn’t misfit on labels like Distant Voices or Naturmacht, amongst others. Next track, Hearts Sea, shows another side initially, by starting off the blasting, highly intensive way. The rawness of this opening sequence, however, stands in harsh contrast with the semi-emotive atmosphere – the latter expressed by the fabulous shoegazing tremolo leads especially. With Blackest Oceans, Apnea delve even deeper within abyssal regions of the mind, searching for an equilibrium of funereal, ethereal and malignant feelings. The album goes on the same way. It’s a truly fantastic aural pleasure, this combination of ambient darkness, blackened grimness and deep-emotional melodies, combined and expressed through majestic and magnificent compositions, maintaining both integrity as well as external anger. The songs are multi-layered, permanently interchanging in between different melodies, tempos, emotions, yet constantly keeping you attracted to / focused on the aural output. So, forget about Silent Cities, because Ethereal Solitude did arrive!